Stretches over two full weeks in late November, when my film festival schedule is otherwise clear. Though it’s been around since 2004, it seems to be finally coming into its own, screening a combination of festival hits, prize winners and undiscovered gems. Best of all, all screenings are completely FREE, thanks to the sponsorship of the various consulates, embassies and cultural institutes. France: Entre les murs (The Class) – This Palme d’Or winner never actually made it to TIFF this year, so I’m delighted it’s coming to Toronto in a free screening. Ireland: A Film With Me In It – The presence of Dylan Moran (Black Books) is reason enough to see this black comedy. Poland: Katyn – From Polish master Andrzej Wajda (Ashes and Diamonds), the story of the massacre of Polish intellectuals and army officers by the Red Army in 1940. Wajda, now 82, has said he’s waited many years to make this film, and only now has the political climate and relationship between Poland and Russia made it possible. This is sure to be be an emotional screening if members of Toronto’s large Polish community attend. Portugal: Colossal Youth (Juventude em Marcha) – Pedro Costa’s 2006 film was written about in all the film magazines but has so far been an elusive screening around here. Germany: And Along Come Tourists (Am Ende kommen Touristen) – I remember this playing TIFF in 2007. Intriguing subject matter: A young German is assigned to Auschwitz to perform his civil service and must care for an elderly Polish Holocaust survivor who never left the camp. Denmark: The Art of Crying (Kunsten at græde i kor) – Another 2007 TIFF selection, this film is the story of a very dysfunctional family, seen through the eyes of 11-year-old Allan. And those are only the films I’m already familiar with. Boasting such a strong lineup this year, and at an unbeatable price, Eh! U looks like a can’t miss event. 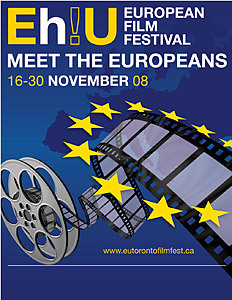 This entry was posted in Film Festivals and tagged #euff08, denmark, europeanfilmfestival, france, germany, ireland, poland, portugal. Bookmark the permalink. Wow, looks like they have a rockin’ line up this year. It crosses over one day with Reel Asian but I think I’ll be checking this one out too. I saw A Film With Me In It at TIFF’08 and it was fantastic. I’m not usually a fan of dark comedy but this one takes the cake. I’ll have to check this one out, eh! I just realized that the Irish film “A Film with Me In It” has been replaced by Steve McQueen’s superb film “Hunger” about the IRA hunger striker Bobby Sands. Though I’m sad to miss Dylan Moran in a dark comedy, I can highly (HIGHLY!) recommend Hunger.